Who invented the Radio? The name of the person credited with inventing the Radio is Guglielmo Marconi (1874 - 1937). Guglielmo Marconi is not only famous as the Italian inventor of the Radio but also as a physicist, electrical engineer and entrepreneur. When was the Radio invented? Guglielmo Marconi invented the Radio in 1895, during the Second US Industrial Revolution / Victorian period of invention (1850 - 1914). The invention of the Radio originated in Italy and is considered a paramount achievement in the field of Science and Technology. Definition of the Radio: The Radio is defined as a communication system based on broadcasting electromagnetic waves or a device that transmits or receives such signals. Fact 1: Who invented the Radio? The Radio was invented by Guglielmo Marconi in 1895 during the Second US Industrial Revolution era of inventions (1850 - 1914). Fact 2: Who invented the Radio? Prior to the invention of the Radio in 1895, communications were sent by the Telegraph which was invented in 1838 and the Telephone which was invented in 1876. Fact 3: Who invented the Radio? The telegraph and telephone dominated communications and few people believed that a "wireless" medium for communication using intangible signals sent through the air would be possible or practical over long distances. Fact 4: Who invented the Radio? Other researchers and inventors such as James Clerk Maxwell, Joseph Henry, Heinrich Rudolf Hertz and Oliver Lodge experimented with using "wireless" radio they did not realize the importance of their work. Fact 5: Who invented the Radio? "Wireless" communication was first discovered when Alexander Graham Bell (the inventor of the telephone), collaborating with Charles Sumner Tainter, invented and patented their invention called the 'photo phone' which was the early persecutor to the telephone. However, their "Wireless" communication had no use at this point in time as electricity did not exist. Fact 6: Who invented the Radio? Heinrich Hertz was the first to send and receive radio waves but the first commercially successful radio system was invented by Guglielmo Marconi in 1895 and and patented by Marconi in March, 1897. Fact 7: Who invented the Radio? The inventor of the Radio, Guglielmo Marconi, was born on April 25, 1874 in Palazzo Dall’Armi Marescalchi, Bologna, Italy and died on July 20, 1937. Guglielmo Marconi developed and marketed the first successful long-distance wireless telegraph and in 1901 broadcast the first transatlantic radio signal. Fact 8: Who invented the Radio? The early years of Guglielmo Marconi were spent in Palazzo Dall’Armi Marescalchi, Bologna, Italy where he was raised by his family. He was the second son of a wealthy Italian landowner and an Irish mother Annie Jameson, granddaughter of the founder of the Jameson Whiskey distillery. 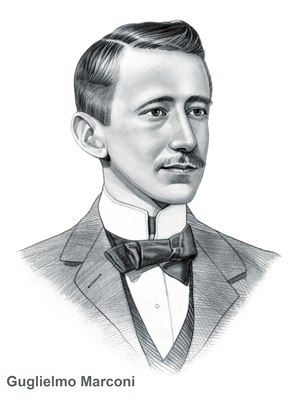 Guglielmo Marconi was educated at University of Bologna where he developed a deep interest in science and technology and the great inventions of the Industrial Revolution. Fact 9: Who invented the Radio? Following his education he began researching the experiments surrounding radio waves made by Heinrich Hertz. Guglielmo Marconi then began to conduct his own experiments into radio waves. Fact 8: Who invented the Radio? Marconi began his experiments in late 1894 at the family home at the Villa Griffone at Pontecchio Bologna, Italy. He was just twenty years old. Fact 9: Who invented the Radio? Guglielmo Marconi significantly improved the performance of the apparatus used by Heinrich Hertz. Marconi progressively increased the distance for transmission and reception of signals across a room, then down the length of a corridor, from the family house and then into the surrounding fields. Fact 10: Who invented the Radio? In 1895 Guglielmo Marconi achieved signal transmission and reception over a distance of about 2km (just over 1 mile). He went from signalling a successful experiment with a handkerchief and then as the distances increased by firing a gun shot. Fact 11: Who invented the Radio? In January 1896 Guglielmo Marconi travelled to the UK and filed the world's first patent for a system of telegraphy using wireless transmission of voice signals with radio waves. Fact 12: Who invented the Radio? The British Patent number 12039 was filed for "Improvements in Transmitting Electrical impulses and Signals, and in Apparatus therefor" on the 2nd June 1896. The specification for his invention stated that it related to "the transmission of signals by means of electrical oscillations of high frequency, which are set up in space or in conductors". Fact 13: Who invented the Radio? Guglielmo Marconi then started to quickly demonstrate his invention. In July 1896 he demonstrated his system to the to the Post Office and then on September 2, 1896 at Three Mile Hill on Salisbury Plain attended by officials from the General Post Office, the Navy and the Army. Fact 14: Who invented the Radio? His demonstrations continued in 1897 across Salisbury Plain where the signals achieved a range of 7 miles (11.2km) and then onto establishing communication across the Bristol Channel. He then set up experiments on the Isle of Wight across the English Channel. Fact 15: Who invented the Radio? In 1897 Guglielmo Marconi registered his company as the Wireless Telegraph and Signal Company and then, in December 1898, he established the first wireless factory in an old silk factory in Hall Street, Chelmsford, Essex. Fact 16: Who invented the Radio? In 1901, Guglielmo Marconi achieved communication over 198 miles between the Isle of Wight and the most south-westerly point of the British mainland at the Lizard peninsula in Cornwall. Fact 17: Who invented the Radio? One of the major problems Marconi faced was interference between transmitting stations. He therefore invented a transmitter and receiver system in which all four major components were tuned. Fact 18: Who invented the Radio? This invention led to the famous 7777 Wireless Patent that was issued to Marconi's Wireless Telegraph Company on April 26, 1901 "for improvements in apparatus for wireless telegraphy". The new technique made it possible to span the Atlantic by wireless. Fact 19: Who invented the Radio? He then went on to make the First Transatlantic Signal on December 12, 1901, between his radio station in Poldhu in Cornwall to the American Station at Signal Hill, St. John’s, Newfoundland. Fact 20: Who invented the Radio? One of Marconi's greatest aims was to perfect "wireless" communication in order to break the isolation of those at sea. This achievement led to many lives being saved at sea. Fact 21: Who invented the Radio? In January 1909 RMS Republic, a steam-powered ocean liner of the White Star Line's Boston service, nicknamed the "Millionaires' Ship", collided with an Italian steamer, the SS Florida, in a thick fog off the US East Coast. Jack Binns, the Marconi radio operator aboard the RMS Republic, sent out a total of 200 messages to help guide rescuing ships to the ship’s position. The radio signals helped to save the lives of all the 1600 passengers who had survived the initial crash. Fact 22: Who invented the Radio? The invention of the Marconi Radio played an important role in the most famous collison of all time when the RMS Titanic struck an iceberg and sank on 14 April 1912. The sinking of the Titanic led to the terrible loss of 1503 lives, but a total of 705 survivors, one third of the passengers people were saved due to the distress calls from the Marconi wireless equipment on board. The British Postmaster General, Lord Samuel, went on record as saying "Those who have been saved, have been saved through one man, Mr Marconi and...his wonderful invention". Fact 23: Who invented the Radio? The next decade saw the rapid spread of radiocommunications, with the first news programme being broadcast in August 1920 by the 8MK station in Detroit, Michigan. Fact 24: Who invented the Radio? In 1924 Guglielmo Marconi developed the 'Beam System' that encompassed shortwave directional transmission, which was far superior to the original longwave high power system. The shortwave Imperial Wireless Chain "beam stations" operated in pairs - one transmitting and one receiving. Fact 25: Who invented the Radio? The invention of the 'Beam System' led to the establishment of the Imperial Wireless Chain, a strategic international wireless telegraphy communications network, created to link the countries of the British Empire. Fact 26: Who invented the Radio? In 1931 Guglielmo Marconi set up Radio Vaticano and in 1932 installed the first microwave telephone link between the Vatican and the official residence of Pope Pius XI with the Pope's summer residence at Castel Gandolfo. Fact 27: Who invented the Radio? Guglielmo Marconi died in Rome of a heart attack on July 20, 1937, aged 63 years old and was laid to rest in the mausoleum in the grounds at the Villa Griffone at Pontecchio Bologna, Italy. He was just twenty years old. Fact 28: Who invented the Radio? Italy held a state funeral commemorating Guglielmo Marconi's life. As a tribute to this great inventor, many radio stations throughout the world observed two minutes of silence. Who invented the Radio? Now you know that Guglielmo Marconi was the person who invented the Radio! We hope that the facts in this article have provided the answers to all of your questions about the invention of the Radio and its famous inventor, Guglielmo Marconi.